If you’re driving down a field to test how a disc is pulverizing clods while you have a pallet fork hooked on the front of the tractor and then drive over a furrow made by a plow, make sure the pallet fork is either attached properly or leave it at home. A picture would tell a thousand words right now. Luckily, the pallet fork sunk into the soil. It didn’t bend. It didn’t break anything. No flat tires. And everyone is ok. It just took me, and 3 other people to try to figure out how to get it out of the soil and out from under the tractor without anything bad happening. There has always been a turning back point in my organic transition years where I could just leave it in hay for another year. The hay keeps the weeds down and the work comes during the summer as to not interrupt planting or harvesting of the conventional crops. Hay is a weed suppressor and a soil builder, and I felt at ease knowing I had those 2 things going for me without much effort on my part. But then today, this happened. And it made it real. There’s no turning back now. I am planting organic corn this spring. It’s funny, but as I watched the plow dig up the beautiful roots of the alfalfa plants, my stomach turned upside down. 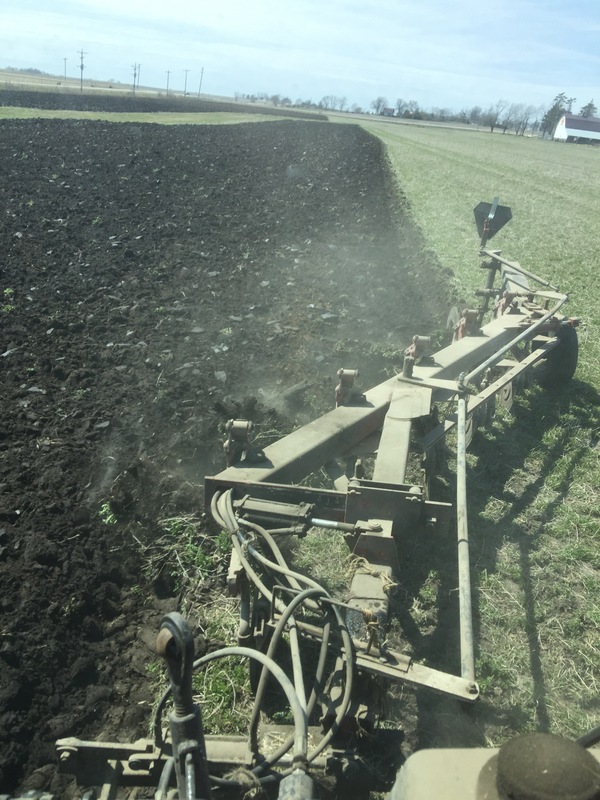 For one, because it was digging up a beautiful alfalfa field and turning it black and tillage makes me cringe, and two, I realized then that I have to cultivate and rotary hoe and I have no other tools I can turn to but scouting, timing and mechanical weed control. And that is all new to me. And sometimes what is new can be scary. And I started to suddenly feel very naked and vulnerable. But the two years of transition have been leading up to this year of corn. Even in the organic world, corn is king. It’s the biggest money maker. I’ve got to make it work. I need success. Organic corn year, here we go!